Nearly one in five patients today have a behavioral health condition that needs to be treated, but limited access to care and reimbursement have greatly restricted the delivery of behavioral healthcare. Studies consistently show that when treating physical well-being, including chronic medical conditions, integrating behavioral healthcare into the treatment plan greatly improves and accelerates outcomes. 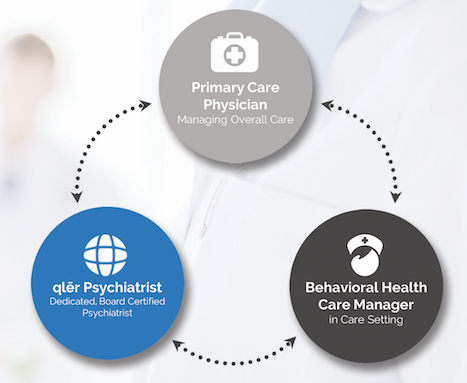 A turn-key, Collaborative Care Model (CoCM) that integrates the patient, the primary care physician, the social worker, and our qlēr Board Certified Psychiatrists to deliver integrated behavioral healthcare to the patient population. Access to behavioral health care that previously was not covered by government or commercial insurance plans, studies consistently showed that incorporating behavioral healthcare in patients treatment plans results in dramatic improvements in patient outcomes and patient satisfaction. Clinical outcomes benefits from integrating behavioral healthcare into their practice, financial benefits from the billing codes created for Collaborative Care Models, educational benefits from collaborating with board certified specialists. Increased access to behavorial healthcare for their at risk patient population, reduction in utilization of unnecessary costly psychatric medications, ability to provide safer more effective patient care.